Never miss a step with ILoveLeasing Mobile. iPhone & Android Now Available. Windows coming soon. Stats show consistent, timely prospect communications through ILoveLeasing increase lease conversions by 36%. Target best response ad sources, personnel performance; track real-time demographics to develop the most effectual marketing agendas. Track advertising investment productivity down to the cost per lead and absorption of the available budget. I Love Leasing software is created in a continuous delivery environment and features a mature software stack.It offers robust integrations with property management accounting software, revenue management software and other third-party services. For a comprehensive overview of how I Love Leasing will interface with your current work flow, request a personalized DEMO. 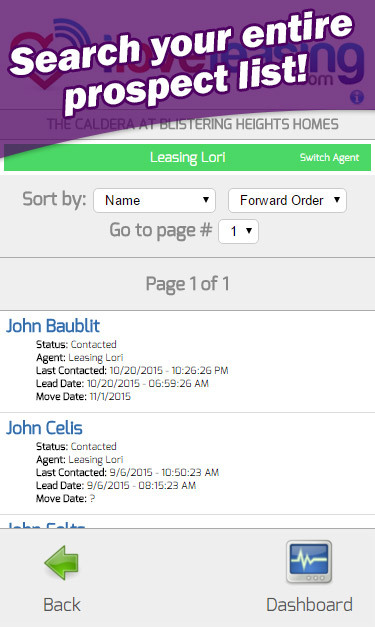 I Love Leasing is the preferred lead management platform for multi-family real estate management companies. 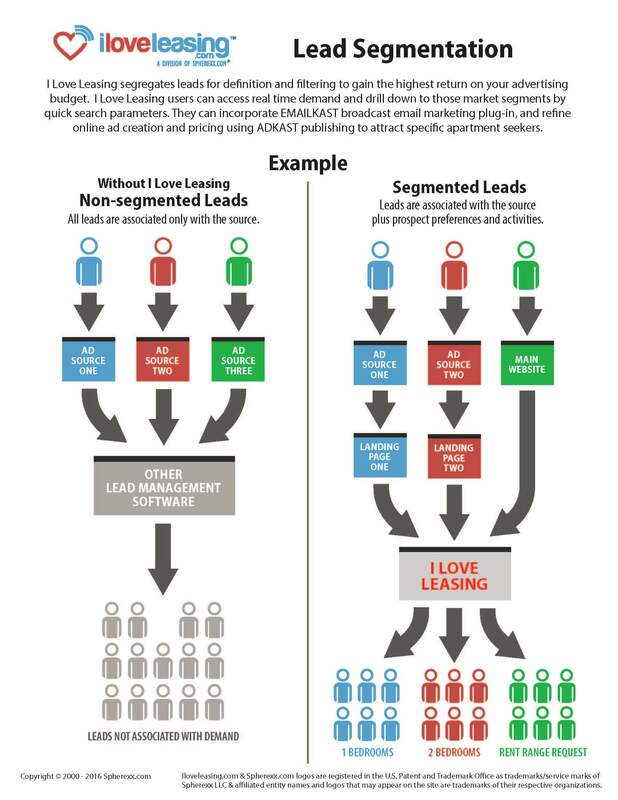 It serves the entire lead lifecycle, from lead generation to move-out. I Love Leasing aggregates leads into a conversion-centric dashboard that performs lead nurturing, closing and tracking functions. It automatically collects demographic data that computes demand and correlates advertising spend and budget take; it computes cost per lead and advertising source feasibility statistics. Each lead activity is tracked individually and corporately, down to what a prospect views on the dynamic brochure: at what time and how often. Mobile and Tablet complimentary versions are available plus SWEETSPOT DASHBOARD, an iPad/Tablet/Laptop shortcut program that gives users immediate access to all their cloud-based software along with on-the-go leasing tools. DOWNLOAD CASE STUDIES to see how I Love Leasing has increased lead and lease conversion with moneymaking results. I Love Leasing partners seamlessly with hundreds of advertising sources, services, yield management software, and popular property management accounting software through advanced bi-directional interfaces that reduce repetition and entry errors. 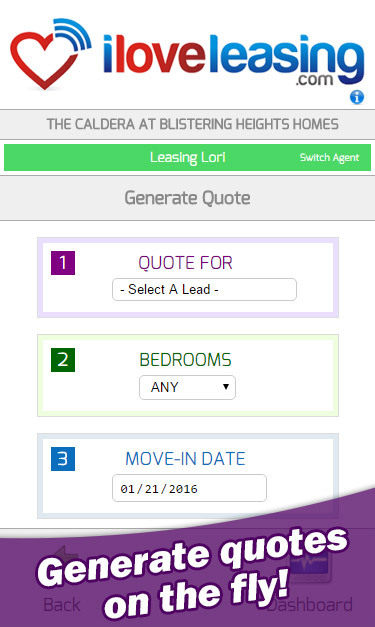 Users may incorporate real time availability and generate professional quotes inside I Love Leasing’s lead management dashboard. Visit this link to view some of our popular INTEGRATIONS. Pair I Love Leasing with LEASINGBOOK point of sale tablet application and acquire guest card priority information using a driver’s license scan. Our program is the only CRM of its kind that eliminates and merges duplicate guest cards and manages multiple occupants. I Love Leasing is the sales coach who is always present with inspiration, scheduling tools, reminders, dozens of professionally written sales letters, and a digital brochure that reports readership responses. 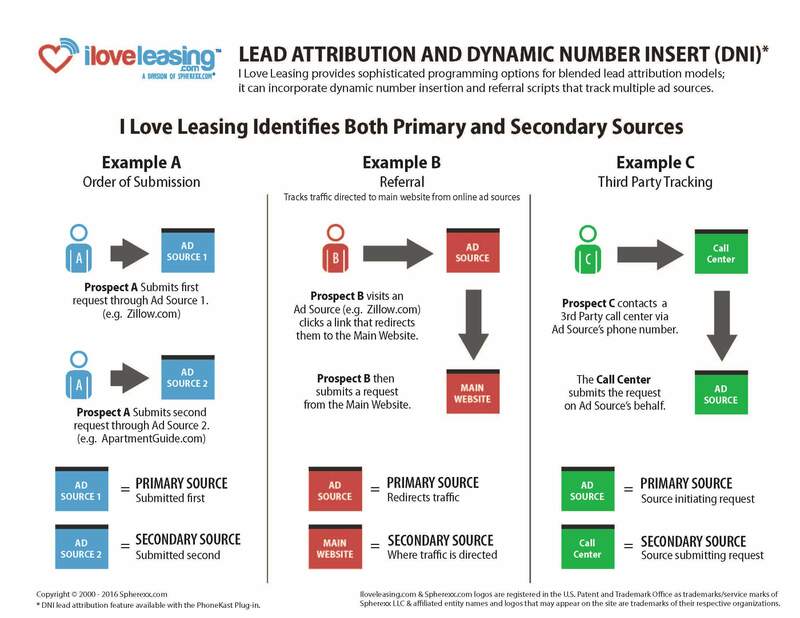 When you want to know what ad source is producing the highest lead/lease count at what cost per lead/lease as compared to all other advertising sources, and for what percentage of the advertising budget, glance at I Love Leasing’s Advertising Cost Report. The program has already done the math and has an answer waiting for your review, along with a rating scale for quick drilldown. Advanced dynamic number insertion (DNI) lead attribution is available for detailed analysis. 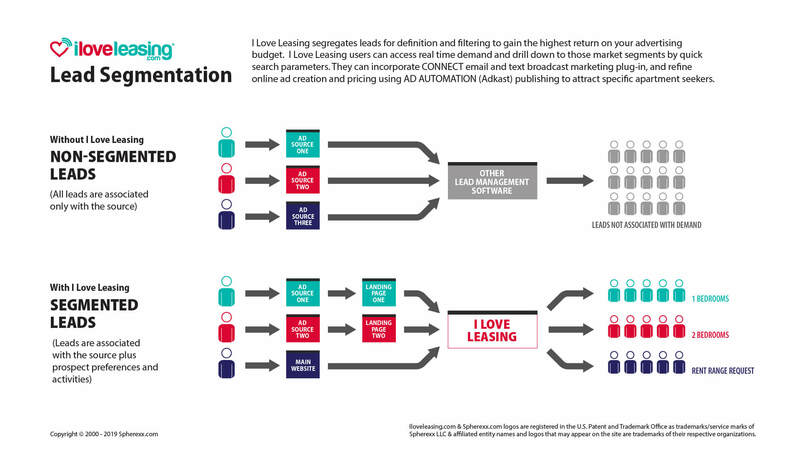 Schedule a private DEMO to discover how I Love Leasing will serve your marketing initiatives. I Love Leasing also computes monthly advertising costs which assists in future budget planning over time, call tracking details, and geographic distribution. Personnel performance reports are available for capture, closing, tours, and timely communications. Gain immediate community, region and companywide performance overviews with I Love Leasing’s Executive Dashboard. Claim rate, contact rate and response times are immediately visible in real time, along with lead, lease and tour totals. Your star staff members and advertising sources are evident at first glance. I Love Leasing reports from initiation; it builds a rich data system that supports staffing and spending budget considerations for years to come. 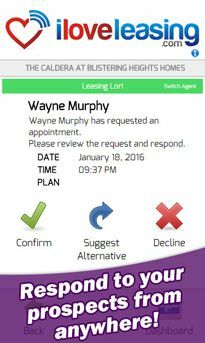 Set up proprietary access levels to keep onsite managers and leasing team members informed and ready to make helpful recommendations. Lead and lease analyses are exhaustive. I Love Leasing drills down cost per lead, cost per lease, percentage of budget spend, performance score and comparison, prospect demographics; and it offers optional leasing call recordings through PHONEKAST for inbound and outbound calls. EMAILKAST broadcast email option provides advanced readership response. ADKAST ad creation and price syndication option provides Internet Listing Service feedback and delivers dynamic number insert (DNI) into I Love Leasing. ILoveLeasing maximizes closings and minimizes work hours; it provides instant organization, effective follow-up and integration with our accounting platform. It tells us how our advertising investments are paying off and updates our online ad content and pricing with one broadcast. Our team would not want to ever be without it. I Love Leasing CRM provides a process-driven, precision workflow which is very helpful tool for our agents, and it increases their efficiency and responsiveness to prospects. I never need to wonder how much traffic we are getting or what advertising sources are working and which ones aren't. My media spend is much more targeted thanks to the data I review regularly through I Love Leasing. I Love Leasing is flexible enough to accommodate our specific and unique leasing regimens. It keeps our revenue management pricing on hand and we can deliver a branded email response and quote to a prospect with a few clicks. I Love Leasing is an easy to use yet highly sophisticated customer relationship management tool. I have used I Love Leasing for the past four years and the program has improved efficiency, reduced advertising spending, and allowed for real time executive reporting that has enhanced my overall decision making. I would enthusiastically recommend this program to any owner or operator who desires roll-up performance analytics, improved onsite efficiency, and the ability to make more strategic marketing decisions. I Love Leasing has proven to be an excellent return on investment for my clients. leasing process, allowing us to improve both staff and Lead Source performance. The resulting savings have been significant. and what's going on onsite. To me, that's more valuable than any shopping report could ever be. Want to send your prospect list an invitation to an event or announce a special? Emailkast is available to I Love Leasing users for email broadcasting, much like Vertical Response or Constant Contact, although it offers many more advantages. It is affordable, response emails deliver directly into I Love Leasing CRM for conversion and are reported inside Emailkast. It supports Fair Housing guidelines and all correspondence is easily tracked and archived. Emailkast is CAN SPAM compliant and it supports unsubscribed addresses by automatically segregating them from your mailing lists. The inviting pre-built email templates proclaim your brand with content customization features. Organize your broadcast audience from your prospect list and keep in touch with your entire prospect pool with Emailkast. It is very time consuming and error prone to update pricing and advertising targets across the Internet. Set up your advertising elements in ADKAST and broadcast pricing and feature updates, deposits and leasing specials to forty-plus Internet Listing Services (ILS). Adkast is available to I Love Leasing users that have Yardi, AMSI, Entrata, ResMan Cloud, Rainmaker LRO, RentPush, Yieldstar, MRI, Rent Manager, QuickBooks, Jenark, or AppFolio services in place. Integration fees may apply from your accounting software provider. Consider adding live pricing to your property website using our automatic pricing feed for real time availability. Review this effective conversion tool by visiting our sample at PRICING PUBLICATION which engages many calls to action. It is ideal for publishing revenue management per unit pricing as well as conventional accounting software. PhoneKast is an outbound and inbound call tracking service that measures and records identified phone numbers for advertising sources. 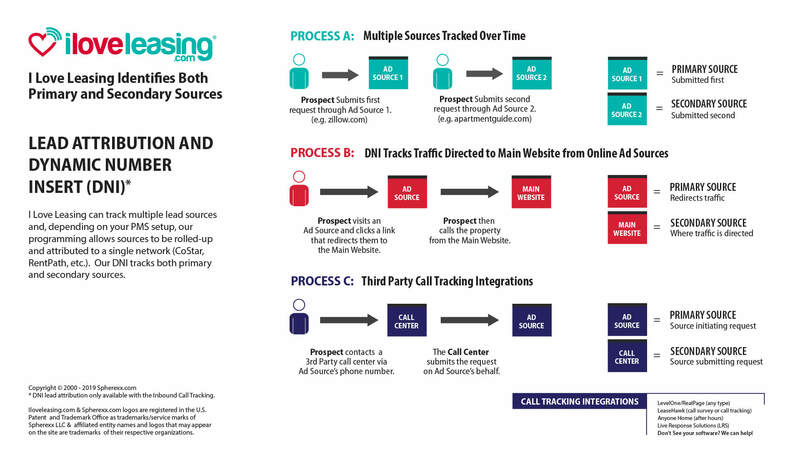 The inbound call tracking service is available to Spherexx.com clients and it integrates directly with I Love Leasing and Adkast. 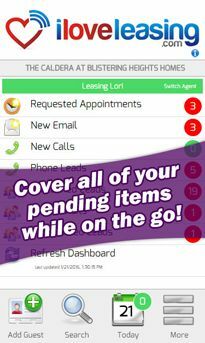 The service segregates leasing calls from management related calls and it provides ten incoming call measurement numbers with unlimited minutes, plus an option to add additional phone numbers. 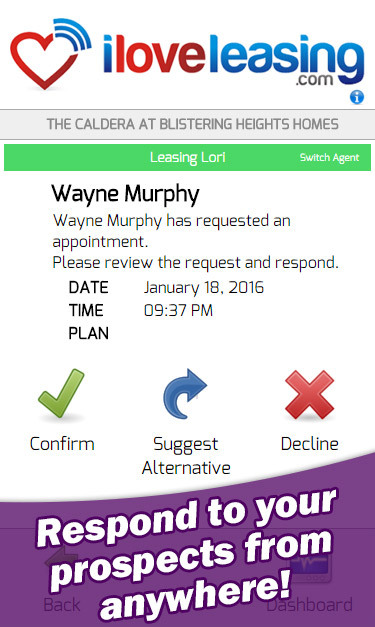 There is a click-to-call option inside the I Love Leasing dashboard that saves prospect information and promotes scheduled follow ups. 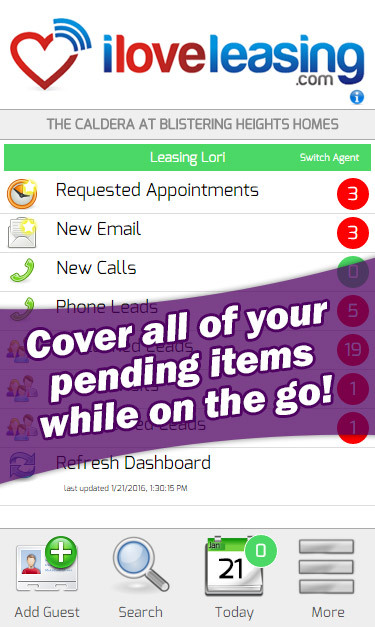 Additionally, the outbound call feature option records outgoing telephone calls and it is a valuable training tool that is easily added to Phonekast for I Love Leasing subscribers. You may elect to add Dynamic Number Insertion (DNI) when using Phonekast. Since many online advertisements direct traffic to your property website, we built a dynamic number insertion system. This system detects where the traffic is coming from and dynamically insets the appropriate call tracking number into your website. I Love Leasing also offers a central office license where companies can field their digital leads and phone calls into a central location. This feature is available for a minimal monthly charge of $10 and offers configurations to accommodate multiple property options, such as small communities with one leasing team covering several locations. I Love Leasing can assure all prospects receive the same response opportunity and can be re-routed to additional locations accordingly. **iLoveLeasing billing capped at $200/Month. Leasing Book billing capped at $150/month. Pricing does not include integration with the client's accounting program. I Love Leasing "month to month" contracts are .75 cents per unit per month & capped at $250/mo plus we will waive the $100 setup fee per property. 30 day paid notice to cancel required. Packaged as 10 lines for $50 per month per property with up to 4,000 minutes + $100 one-time setup fee per property. Overages are .05 cents per minute: $4.95 per line for each additional line. Calls forward to main property phone line. Local or 800 Numbers allowed. Available only with ILoveLeasing subscription. Up to 500 minutes $.05 per minute for each additional minute. Calls forward to any number the agents choose. Available only with ILoveLeasing subscription. Requires call tracking and recording. 12 randomly selected calls per month. 15 point checklist for scoring calls. Additional scoring levels available. Monthly reporting provided. Emailkast is an email broadcasting tool with pre-designed email templates. Up to 25,000 email sends per month, no contract required. Priced at $.20 cents per unit per month and capped at $29.99 per month. Available only with ILoveLeasing subscription. Synchronized digital advertising creator and price publisher. Up to 10 ad sources. $5 per month for each additional ad source. Available only with ILoveLeasing.com or RentPush.com subscriptions. $100 one-time setup per property plus $35 per month per property. Send up to 100 texts per month for free, then 2 cents per text thereafter. Available only with ILoveLeasing subscription. Add interactive chat to your website and automatically deliver chats into ILoveLeasing for follow-up. Priced at .10 cents per unit per month, but capped at $30 per month per property plus $100 setup fee per property. Setup fee includes chat software install on 3 workstations in the leasing office. Additional workstation installs are $25/wkstn. ILoveLeasing has a mobile app you can download from the Google Play (Android) or Apple Itunes (iPhone) store for free. Available only with ILoveLeasing subscription. First 100 texts free and 2 cents per text thereafter. ILoveLeasing will provide your web developer with a script to add to your website for a one time fee of $25 per property. ILoveLeasing inbound call tracking subscription required. If we have to assist your web developer, then an additional 1 hour consulting will be billed at $100/hr. Appointments synch to your calendar - FREE. ILoveLeasing provides a digital brochure & email template for your properties. We do provide one FREE color scheme change per company. However we offer full customization to match your corporate branding for a one-time fee of $1,500. ILoveLeasing provides a private "go live" training with your teams and then we offer "open to all" group webinars/trainings monthly. We offer these to district managers, regional managers and corporate executives so you can be confident in the action items we provide via reporting. 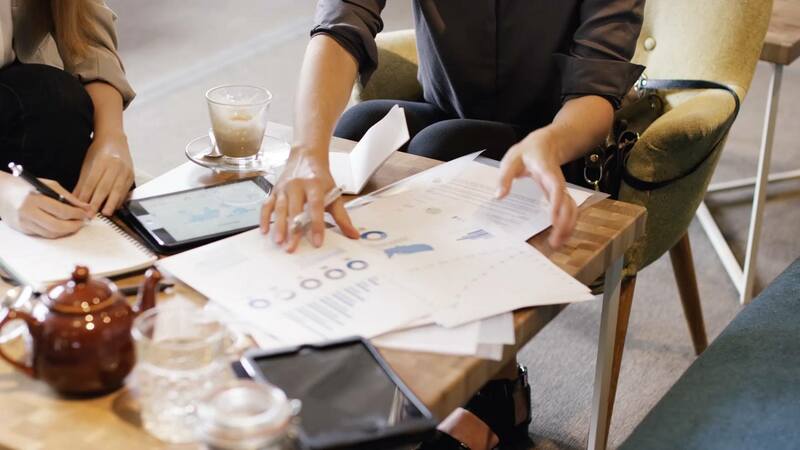 We will assign an account manager to your company that will learn the way you do business and will help tailor the software to perform best for your goals. Pay the regular per-unit pricing plus just $10 per month per property. 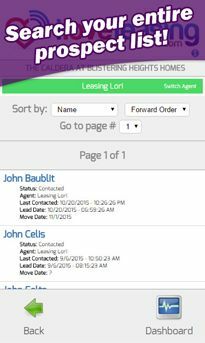 Manage all your communities' prospect communications, demographics, advertising budget and personnel performance using the Central Leasing Office option. PLUS you will be able to configure several ILoveLeasing Dashboard preferences inside this special edition. If you have a property in construction and don't have your permanent leasing team in place, then consider using our I Love Leasing team to answer phone calls or emails for prospects wanting to secure a place on the wait list. $150 one-time setup fee per property and $200 per month per property. Available only with ILoveLeasing subscription. 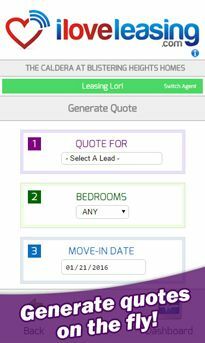 Leasing Book is a native tablet app. 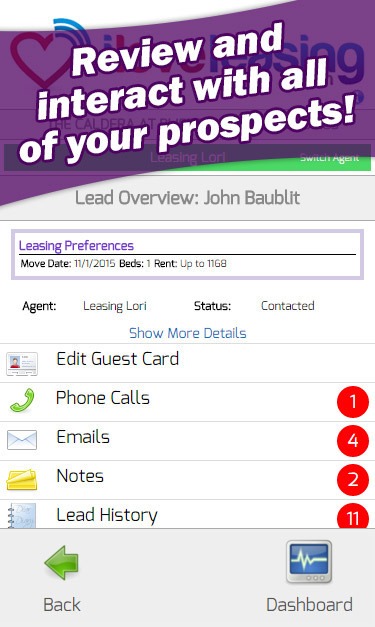 Leasing Book is a sales coach that scans a prospect's drivers license to populate a guest card automatically along with matching a unit to a prospect's leasing preferences. Priced at $.25 cents per unit per month (capped at $150 per month per property) for Full I Love Leasing users + $100 setup fee per property. Lite I Love Leasing users will pay $.50 cents per unit per month (capped at $200 per month per property) + $100 setup fee per property. 200 outbound text messages are included with the monthly fee, then 2 cents per text after the first 200 texts. Our digital rental application is fully customizable so every field of data or question asked can be edited. It is encrypted with an SSL and is fully responsive, so it can automatically size to a mobile, tablet or desktop viewer. The rental application can be linked to from any website or advertising source. There is a onetime $250 setup fee (per property) and client must provide a copy of their current application. Additional changes and customizations are billed at the hourly rate. The app is $19.99 per month per property + $1.00 per e-signature. The digital electronic signature is optional. Need call scoring? You will need to have leasing call recording from I Love Leasing or another call tracking vendor that we can access the recordings to score. There is a one-time $50.00 setup fee per property, then $300.00 per month per property for 25 (twenty-five) randomly selected calls per month per property. Goal would be to have each agent at the property scored each month. We can vary & customize this package to whatever you need. We are independent integration experts and offer custom programming solutions! I Love Leasing has multiple ways for the front line leasing teams to work leads from their desktop computers, laptops, tablets and smartphones. 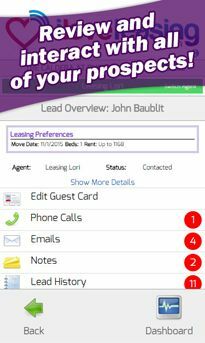 I Love Leasing mobile companion puts all the power of lead nurturing in a mobile "go anywhere" app for both Apple ® and Android ®. Get the I Love Leasing Mobile Companion Now. I Love Leasing mobile companion requires a license to use, but you can view the app.